There are many types of floor surfaces and many of them are expensive. The flooring, especially in the entrance is often the first thing people see when entering your work place. To give that all important first impression it should always look it’s best. Besides, a well maintained floor reduces wear and tear on the surface. Reflections Cleaning Services provides a carpet cleaning service for your home. We also provide commercial carpet cleaning throughout our area to various clients, including schools and colleges, restaurants, hotels and letting agents. Our professional standards are applied in exactly the same way whether we are cleaning carpets in your home or commercial premises. Our carpet cleaners have many years of experience and constantly update their skills with training by PROCHEM. Prochem is a highly respected company that specialise in carpet cleaning technology. They invest in developing new technologies to maintain the highest standards of training and service. Prochems carpet cleaning products are by Royal appointment to Her Majesty the Queen. Click here to view the PROCHEM promotional video. A good quality carpet can easily last for twenty years and more if properly cared for. Carpets need care and maintenance, especially in high traffic areas and often regular vacuuming does not get to the root of the dirt that could be making your carpets dull, lifeless and unhygienic. We can arrange a time that suits you and on arrival we extensively pre vacuum all carpets that are to be cleaned. 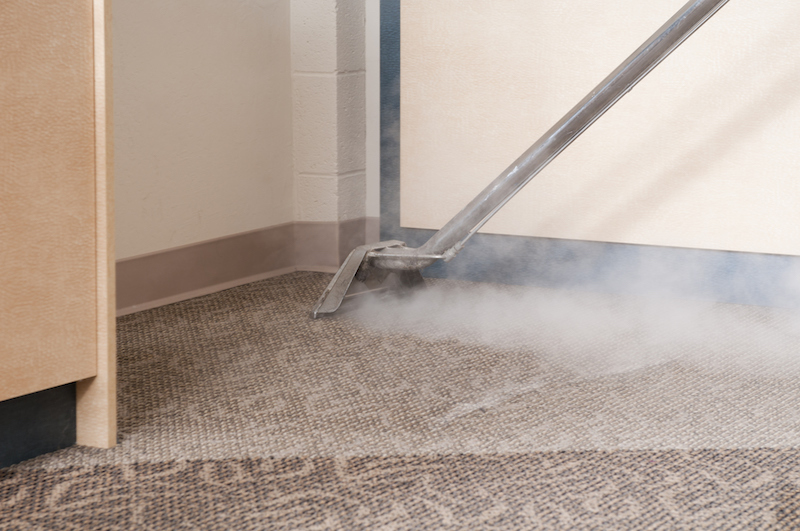 This is an important part of our cleaning process, essential to remove dry dirt and dust before any cleaning takes place, an aspect often overlooked by many carpet cleaners. Spilt coffeeStains, spillages and ground in dirt that can easily occur from children, pets, parties, home improvements, tenants and day to day living are hard to remove and most off the shelf stain removers could leave your carpets with patchy discolouration and beyond repair. We offer a stain removal service. Prochem have developed many chemicals to remove stains, all of which are Woolsafe Approved. The chemicals along with our experience can rescue your carpet and keep it looking fresh for many years. That’s why it’s always best to call Reflections Cleaning Services to expertly remove the stains. Attempting to remove stains with harsh stain removers yourself may permanently damage your carpet so call us for a FREE QUOTE. A very helpful engineer spilt black coffee in one of our offices while removing a coffee machine. Our client had asked us to carry out an end of let clean, to hand the property back to the landlord. Chemical treatment and extraction saved our client the cost of replacing the carpet. Happy client, happy landlord. From this kids abstract art work on the carpet. To this, art work gone. Client very happy! We offer our clients a FREE carpet clean at the beginning of a cleaning contract. To compliment this offer we can include an annual carpet clean with a stain removal and maintenance service. If you have a spillage simply call us and we will remove the stain straight away. We are happy to include heavy traffic areas such as a reception in this offer. This is vital for first impressions if you have visiting clients to your office. and ensures that your carpet will look it’s best constantly. All chemicals comply with REACH (Regulation, Evaluation, Authorization and Restriction of Chemicals) regulations. This ensures the safety of your carpet, your health and the environment.